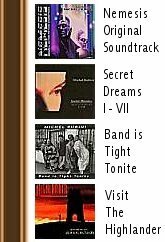 Volume I, the first CD of the series is composed of the music from the first 4 episodes that I scored in the same order that I received the shows from the producers. The first show's title is "Lovesounds," a tale of an egomaniacal symphony conductor who is more interested in his new stereo sound system than his beautiful, unfulfilled wife. The second show's title is "Remembering Melody," a graphic lesson most suited to those people who make promises they can't keep a little too quickly and a little too lightly. The third show's title is "Face To Face." Starring one of my favorite actors, Robert Vaughn (The Man From U.N.C.L.E. ), this is a wonderfully morbid story about the consequences of what happens when a plastic surgeon tries to live "a little too high" and botches an operation on the wrong woman. The fourth show's title is "And If We Dream." All I can say about this one is: School teachers out there, you better think twice before you let your mind become too focused on your female students and not on correcting their homework. 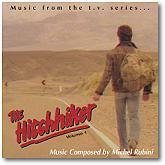 Enjoy the first release of "Music from The Hitchhiker-The Series." THIRD EPISODE "FACE TO FACE"
FOURTH EPISODE "AND IF WE DREAM"